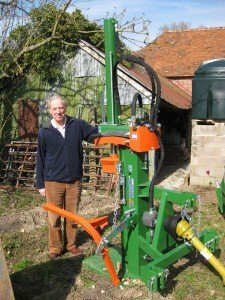 The Greywell Hill Estate has been awarded £6,425 as a 40% contribution towards the purchase of a new pto driven firewood processor, log splitter and 4 tonne trailer. This equipment will not only provide a safer way to cut and split logs (the processor comes with a hydraulic log lifter), it will also provide the means to transport it to local homes (within 5 miles of the estate). The woodlands are managed under the England Woodland Grant Scheme (administered by the Forestry Commission) for their biodiversity value. Much of the woodland is designated a SSSI (Site of Special Scientific Interest) The woods are under a rotational coppice cycle as well as other forms of silvicultural management. This project aims to make economical use of the arisings from the management of the woodland. Wood that cannot be sold as timber or usable coppice material can be sold as firewood, which is a low carbon source of energy to heat homes. Local students often come to work on the estate and the project will provide more work and learning opportunties for those wishing to discover more about working in forestry management. It provides an income to the estate and a environmentally sustainable way to use a by-product from woodland management and a low carbon fuel source for local people, meaning low fuel miles.